The thing that runners hate most in the world is being unable to run – and when pain or injury strikes, that’s usually where a runner ends up. Yet, most wait until they’re at this point to see a physical therapist. Only when they’re in the trenches of injury do they find out about their strength deficits, motor control issues, poor movement patterns, poor nutrition and recovery, gait abnormalities….all the many, many things that can cause pain during running. Most of us, runners and non-runners alike, get an annual physical. We check up on our hearts, our lungs, our eyes and ears and digestive systems regularly….but what about our musculoskeletal system? 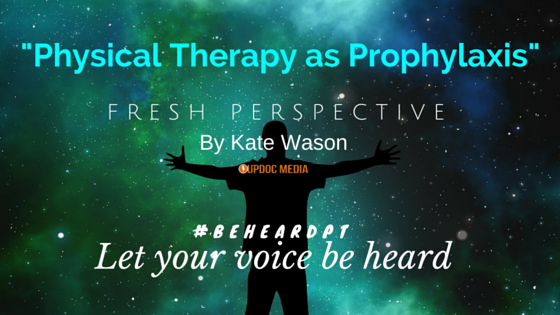 What if everyone could go see a physical therapist once or twice a year to get their movement checked out, rather than waiting until you’re sidelined? Most runners don’t know they can do this, and there are likely PTs who don’t know either! But it makes perfect sense – our DPT curriculums really push the model of PT as primary care, and that means SCREENING. Not just blood pressure and heart rate, but movement screening. That’s at the core of what we do isn’t it? I believe healthcare as a whole needs to move towards a more preventative model (promoting healthy eating and regular exercise vs. medically managing diabetes and heart disease), and that should includes tuning up runner’s bodies regularly to prevent them from breaking. I am confident that physical therapists can ABSOLUTELY prevent running injuries through screening and education, and if such a service were commonly available, runners would be all over it. As a runner who’s been around the injury block a few times, I can say that with absolute certainty. There are a few good platforms already in place to help PTs start screening. Jay Dicharry’s Anatomy for Runners outlines multiple ways to test whether an individual has the strength, tissue extensibility, and motor control necessary for running, especially when the body starts to fatigue. He offers very specific corrective exercises and progressions that a runner can take themselves through to build up their bodies. Kelly Starrett does much of the same in his new book Ready to Run; it’s a looser framework with twelve “standards” for healthy running, some based on lifestyle and some based on mobility. I’ve personally tested out a few of his standards on myself and am pleased to report decreased pain, faster running, and best of all faster recovery. Last but not least, Gray Cook’s Functional Movement Systems. The FMS and SFMA are really the best movement screens out there right now; I think you’ll find that the assessments in many other systems (including Jay’s and Kelly’s) are rooted in the FMS patterns. At Duke, I’m part of a team that provides movement screens (using the FMS) to local area high school teams and to the greater Duke community. It’s a great way to facilitate awareness about movement health, and I like to think that it’s kept some young athletes on the playing field and the track. Unfortunately, I’ve also seen a lot of missed opportunities and a lot of half-hearted screening. For example, I recently helped (as part of an interdisciplinary team) provide sports physicals to high school athletes. We took vitals, did vision checks, took past medical history (all of which are essential)….but nobody checked MOVEMENT! It goes without saying that movement is an essential part of athletics…shouldn’t we make sure young athletes are “moving well before they move often” (to quote Gray Cook), at high intensities, and with load? The FMS takes only a few minutes and could make a big difference not only in keeping athletes in the game all season long, but keeping them healthy and active their whole lives. So, where do we start? I believe everything begins with education, for both the PT and the runner. Some DPT programs incorporate FMS and SFMA into their curriculum, but I would encourage every student and PT to delve into these systems. It’s crucial to know when to use the FMS screen (for individuals without complaint) and when to use the SFMA (for individuals with pain, after you’ve ruled out trauma, medical pathology, and neurological involvement). We must also be familiar with the rules of good screening, namely that if pathology (in this case, movement dysfunction) is found, we must have a solution for it. Thus, it follows that we need to be well versed in the corrective exercises that go along with each screen. I also think creativity is important; Jay Dicharry, Kelly Starrett, and Chris Johnson have all expanded on the functional movement screen and created their own assessments that can be used preventatively. I see no reason why a seasoned clinician, or even a fresh new grad, couldn’t create their own screen for a specific population; in fact, I think innovation like this is important for getting ahead of injuries and stopping them before they happen! Next, we take our education out into the community. Link up with local running clubs and running stores and with local high schools, offer free movement evaluations and talk about why they’re important. You can even do a movement screen on your patients at discharge, and talk to them about coming back every so often to check in and make sure their movement is still on track. Your runners will be especially open to this if you’ve just gotten them back to pain free running; not only will they be keen to prevent another injury, they’ll already trust in your skills. You don’t even need to own your own clinic to start seeing patients “prophylactically”; all you need is a table and your two hands! Of course, I don’t believe we can eliminate running injuries for good. To some extent injury is the price we pay for constantly testing the limits of the human body and I think that’s where the beauty of running lies. I firmly believe, however, that we can and should test the limits of the human body with solid movement patterns and good motor control! Thus, by increasing our emphasis on screening and prevention, I think we can allow more runners to push those limits, break down performance barriers, and most importantly, do what they love without unnecessary interruption. If that’s not doing right by our patients, I don’t know what is! 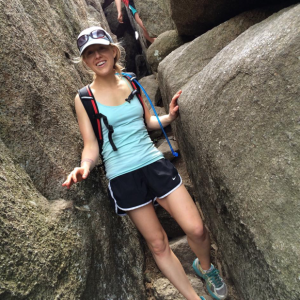 Kate Wason is a first year DPT student at Duke University. She has a B.S in Biology from the College of William and Mary, as well as an M.Ed in exercise physiology from University of Virginia, and has also worked in endurance sports coaching with Carmichael Training Systems. Kate is an avid runner herself, and, like many athletes, was first introduced to physical therapy as a patient during a string of bad injuries. She, along with a colleague, has just launched the Fit Nerd Physios blog (https://fitnerdphysios.com) and hopes that it will help her tie together her perspectives as a PT, physiologist, coach, and athlete. When she’s not studying or running, you can find Kate hiking, cycling, deadlifting, or exploring local breweries.